Roundtable discussion. The Genius of Varlam Shalamov's work – How Can It Be Conveyed in Translation? Presentation. Teffi (1872-1952) – Tragedian or Humorist? Roundtable organized by Russia Beyond the Headlines: How to Make Russian Literature More Popular in the UK? Participants: Nina Dashevskaya, musician and writer, winner of Kniguru Awards; Georgy Urushadze, Director of the Russian Literature Centre and Kniguru Awards; Karine Karmenyan, Director of the Russian Children's World project and the Director of St James's Publishing Ltd. In PUSHKIN IS OUR EVERYTHING, filmmaker Michael Beckelhimer goes on a journey through Russia to learn how Russia’s most famous 19th-century poet became contemporary Russia’s supreme national icon – and how his star rose higher and higher at every tumultuous point in Russian history. How can Russia’s national poet help Russia today? In the film we meet Russians who have turned to Pushkin to get them through difficult times: a sculptor, a poet, a priest, a theater group – and a St. Petersburg advertising executive who employs Pushkin in a campaign against racism. Winner of the 2015 Faces of Russia award for the film that “displays the best cinematic reflection of modern Russians, the most innovative presentation of contemporary Russian life to Americans, and the most original personal vision of modern society” at the 2015 8th Annual Russian Documentary Film Festival. Read Russia is pleased to announce the launch of RUSSIAN LITERATURE WEEK 2015, the second in an annual series of live and online events and publications every December celebrating & promoting the translation of classic & contemporary Russian literature into English. Described more formally as “a celebration of Russian literature in translation featuring distinguished authors, translators, editors, publishers, journalists, filmmakers, broadcasters, & arts, education, and cultural institutions,” RUSSIAN LITERATURE WEEK 2015 will celebrate & promote in particular new translations of Russian literature and new film and online initiatives about Russian literature and book culture from publishers and producers large and small. RUSSIAN LITERATURE WEEK 2015 will run December 7-11, 2015, and include readings, panel presentations, roundtables, discussions, plus online events & film screenings. Leading authors, publishers, & translators will preside over our New York City events. Eugene Vodolazkin presents Laurus, his first novel to be translated into English, and talks about the relationship between his personal writing and his work in Old Russian Literature, folklore, and medieval history — two worlds he never thought would collide. He will also discuss why interest in medieval history and literature is experiencing a resurgence. Laurus tells the story of a late-15th-century Russian village healer, devastated by the death of his beloved in childbirth, who embarks on a journey of redemption that brings him face-to-face with a host of eccentric characters and legendary creatures from bizarre medieval bestiaries. The novel won both the Yasnaya Polyana Award and the Big Book Award when it was first published in Russian in 2012, and it has been compared to both Umberto Eco’s writing and The Canterbury Tales. A lively discussion about literature, translation, and Russia’s literary traditions between prizewinning novelist Vladimir Sharov, celebrated translator and Oxford University fellow Oliver Ready, and Dmitry Bak, Director of Russia’s State Museum for Literature. An intimate conversation about Boris Pasternak, his prose, and his poetry – between Peter Finn, journalist and the author of The Zhivago Affair: The Kremlin, the CIA, and the Battle over a Forbidden Book, and Marian Schwartz, one of Russian literature’s leading translators. An in-depth conversation with Leonid Yuzefovich, one of Russia’s leading authors, led by journalist and fiction writer Vadim Yarmolinets. Eugene Vodolazkin discusses Laurus, his first novel to appear in English, with the book's translator, Lisa Hayden. Laurus tells the story of a late-15th-century Russian village healer, devastated by the death of his beloved in childbirth, who embarks on a journey of redemption that brings him face-to-face with a host of eccentric characters and legendary creatures from bizarre medieval bestiaries. The novel won both the Yasnaya Polyana Award and the Big Book Award when it was first published in Russian in 2012, and it has been compared to both Umberto Eco’s writing and The Canterbury Tales. A celebration of Russia’s 2015 YEAR OF RUSSIAN LITERATURE and the future of literature in translation – featuring the host of Russia’s television program “Polyglot” and leading stars of the Russian literary world. Reception to follow. A broad-ranging discussion with authors Vladimir Sharov and Eugene Vodolazkin and the host and producer of Kultura TV's “Polyglot” Dmitry Petrov. The conversation will touch on changes in language in Sharov and Vodolazkin's representations of history and time, as well as specific challenges for translators. Moderated by Lisa Hayden, translator and blogger on contemporary Russian fiction. A deep dive into Alexander Solzhenitsyn’s unpublished works – now being translated and soon to appear in print in English! Additional speakers TBD. A closing night celebration of Russia’s Nobel Prize laureates in literature – with their translators and biographers. Featuring Antonina W. Bouis, translator; Solomon Volkov, author; Stephanie Sandler, Harvard University; and Peter Constantine, translator. FEATURED ONLINE FILM FOR RUSSIAN LITERATURE WEEK – 2015! Pushkin Is Our Everything is a documentary film in which Michael Beckelhimer goes on a journey through Russia to find out how Russia’s most famous 19th-century poet became contemporary Russia’s supreme national icon – and how he’s helping Russia today. The documentary is a revealing jaunt through history, from Pushkin’s fatal duel in 1837 to the fall of the Romanov empire through the communist period. 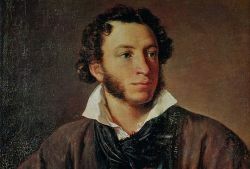 At each of these points, Pushkin rose higher and higher on the pedestal of Russian culture. More Russian Literature is Coming! On June 27 across Red Square from the Kremlin, Read Russia and Russia's Institute for Literary Translation convened the Editorial Advisory Board of the Russian Library, a new initiative designed to bring 100 to 125 works of Russian literature in top-notch English translations to English-speaking readers around the world. The editorial meeting brought together distinguished Russian and American publishers, literary scholars, curators, and bibliographers - Vsevolod Bagno, Dmitry Bak, Caryl Emerson, Edward Kasinec, Irina Prokhorova, Alexander Livergant, Stephanie Sandler, Vladimir Tolstoy, and others - to discuss Russian works of literature meriting inclusion in the Russian Library over the next ten years. The Russian Library will be published in hardcover, paperback, and electronic formats and include multiple online dimensions and multimedia study environments for teaching and learning. Andrew Roth of the New York Times wrote: "Academics at the conference said that the collaboration presented a chance, at least informally, to build the relationship between the two countries at a time of heightened tensions." Read the New York Times article, "Columbia University Press to Publish New Translations of Russian Literature"
New York, NY, May 29, 2015 - Read Russia today announced the winner of the 2015 READ RUSSIA PRIZE, celebrating the best translation of Russian literature into English published in 2014: Vladimir Sharov’s Before and During, translated by Oliver Ready and published by Dedalus Books. The annual literary prize carries a cash award shared by translator and publisher. Translation should not strive for perfection, but for excellence. Perfection is impossible, whereas excellence is only nearly impossible. And excellence is what Oliver Ready achieves in his rendering of Before and During by Vladimir Sharov. He captures the clear voice and confused mentality of the narrator who is able to love both Christ and Lenin, who prays for the sinner Ivan the Terrible and who tries to unravel the legacy of the Bolsheviks. Vladimir Sharov was born in 1952, the same year as Vladimir Putin. We have heard a great deal from Putin both in terms of his speeches and press conferences as well as in his actions – which, as the saying goes, speak louder than words. In a time when the Russian and American leadership both speak past one another, it is especially important to hear other voices from Russia, voices that can speak directly to us and directly of Russia which we in the West all too easily either romanticize or demonize. And it is possible for us to hear Sharov’s voice due to the hundreds of hours of detail-by-detail labor on the part of Oliver Ready, a solitary effort that has now resulted in the public, i.e. published, version in English of Sharov’s own long and solitary labor. His translation gives us all both pleasure and practical value – it is, as they used to say, dulce et utile. It is therefore fitting that the excellence of Ready’s achievement and the vision of Dedalus Books in publishing it be recognized by this prize. Why re-translate the classics? It’s often said that translations have a life span of 50 years, or that every generation needs its own translation of the classics. Tolstoy’s language has not aged for his Russian readers, but the language of his first English translators may now seem dated to the reader in the 21st century. More importantly, our understanding of Tolstoy has changed over the century since his death, as has our idea of what makes for a good translation. Both Rosamund Bartlett and Marian Schwartz have embraced the peculiarities, repetitions, and perceived awkwardness of Tolstoy’s style that often transgress all conventions of good English prose. Bartlett writes that her “translation seeks to preserve all the idiosyncrasies of Tolstoy’s inimitable style, as far as that is possible,” while Schwartz notes that she “found [Tolstoy’s] so-called roughness . . . both purposeful and exciting, and was eager to recreate Tolstoy’s style in English.” True, the two translators go about this in their own ways, and as one might suspect they have their own strengths and biases, but this foregrounding of style is everywhere felt in these new translations. Ultimately, translation represents an act of interpretation. There is no doubt that these volumes, published so beautifully by excellent university presses, present to the English-language reader two magnificent interpreters of Tolstoy’s beloved novel. 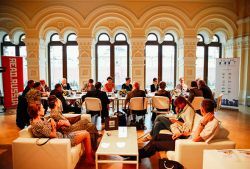 The READ RUSSIA PRIZE carries a purse of up to $10,000, divided at the discretion of the Prize jury between translator and publisher of the winning volume. Congratulations to all the talented nominees! The READ RUSSIA PRIZE is awarded in New York every year for works of Russian literature in English translation. 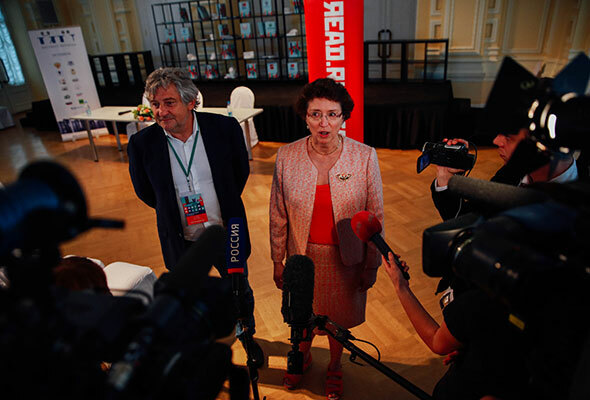 The 2015 READ RUSSIA PRIZE awards ceremony will be held at the very end of Book Expo America on Friday, May 29, at the Grolier Club in New York. Professor Gary Saul Morson, author, translator, and Frances Hooper Professor of the Arts and Humanities at Northwestern University, will help present the awards to the winning translators and publishers. Professor Morson, whose popular classes at Northwestern on Russian literature touch hundreds of students every year, also will present a special new lecture: "Because Everyone Needs a Little Russian Literature." More than 20 new titles, listed below, have been nominated by their publishing houses in 2015. The shortlist will be announced online here on May 20. The 2014 READ RUSSIA PRIZE winner was Sigizmund Krzhizhanovsky’s Autobiography of a Corpse, translated by Joanne Turnbull with Nikolai Formozov and published by New York Review Books. 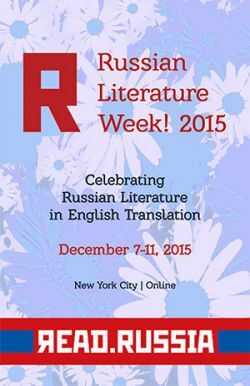 Read Russia is pleased to announce the launch of RUSSIAN LITERATURE WEEK! 2014, an annual series of live and online events and publications designed to celebrate and encourage the translation of classic and contemporary Russian literature into English. Described more formally as “a celebration of Russian literature in translation featuring distinguished authors, translators, editors, publishers, journalists, filmmakers, broadcasters, & arts, education, and cultural institutions,” RUSSIAN LITERATURE WEEK! 2014 will celebrate & promote in particular new translations of Russian literature and new film and online initiatives about Russian literature and book culture from Amazon Crossing, Columbia University Press, Dalkey Archive, Deep Vellum, Dzanc Books, Farrar Straus Giroux, Glagoslav, Melville House, New Vessel Press, New York Review Books, Northwestern University Press, One World, Overlook Press, Oxford University Press, PBS Distribution, Penguin Books, Profile Books, Prospect Books, Pushkin Press, Random House, Skyscraper Publications, Theater Communications Group, WNET/Channel 13, W. W. Norton, Yale University Press, and other publishers and producers large and small. Monday, December 1, 7:00 p.m.
What is the consistent appeal of classics in Russian literature – to translators, to publishers, and to new audiences? A conversation with New York Review Books editor Edwin Frank and celebrated translator Marian Schwartz, moderated by translator and PEN World Voices co-founder Esther Allen. Followed by a reception. Featuring new translations of Alexander Pushkin's The Captain's Daughter from New York Review Books and Lev Tolstoy's Anna Karenina, translated by Marian Schwartz, from Yale University Press. Tuesday, December 2, 12:00 p.m. Does the translation process have to be different for contemporary versus classical works? Does the vocabulary? How does having the author alive affect the work? Celebrated translator Marian Schwartz in conversation with Ross Ufberg, translator and publisher of New Vessel Press, and Ronald Meyer, translator, Adjunct Associate Professor of Slavic Languages, and Director of the M.A. Program in Russian Translation at Columbia University. Featuring new translations of works by Anton Chekhov from W. W. Norton, Andrei Gelasimov from Amazon Crossing, Sergei Lebedev and Vladimir Lorchenkov from New Vessel Press, Leo Tolstoy from Yale University Press, and Leonid Yuzefovich from Glagoslav. Tuesday, December 2, 3:00 p.m.
A discussion with translators and publishers about their wishlists. Wednesday, December 3, 11:00 a.m. Writers, publishers, translators, teachers and technologists interrogate the future of teaching, reading, and publishing Russian literature online and more! Discussions will feature the works of classic and contemporary authors, ranging from the known 19th- and 20th-century masters to new more often vertical authors such as (in alphabetical order) Boris Akunin, Andrei Gelasimov, Victor Pelevin, Zakhar Prilepin, Dina Rubina, Vladimir Sharov, Vladimir Sorokin, Anna Starobinets, Alexander Terekhov, Ludmila Ulitskaia, Evgeny Vodolazkin, Leonid Yuzefovich, and many others. Wednesday, December 3, 7:00 p.m.
Is there a relationship between world events and the choices that publishers make? Why do some literary works get published in translation before they appear in their native language? Publisher and translator Jeff Parker of Dzanc and translators Marian Schwartz and Antonina W. Bouis in conversation about the way the bigger picture (international affairs, state policies) can influence what gets translated, what gets published – and when. Moderated by author, translator, and critic Liesl Schillinger. Followed by a reception. Featuring new translations of Arkady and Boris Strugatsky’s Definitely Maybe from Melville House and Zakhar Prilepin's Sankya from Dzanc Books. Thursday, December 4, 7:00 p.m. The event is made possible in part through Poets House’s Literary Partners Program. Join Read Russia for a glass of wine, readings and a conversation about particular challenges with certain works and authors because of the role language plays in the original texts. Featuring authors and translators Ian Dreiblatt, Genya Turovskaya, and Matvei Yankelevich with their new translations of works by Nikolai Gogol, Daniil Kharms, and Arkadii Dragomoshchenko. Moderated by Melville House senior editor Mark Krotov. Director: Elena Yakovich | RACORD-TV, Russia | 56 minutes | 2014. In Russian with English subtitles. A film about Vasily Grossman, author of Life and Fate, a novel that has been called “the War and Peace of the 20th century.” Completed in 1959, the manuscript of this anti-Stalin novel was confiscated by the KGB and first published in Switzerland only in 1980, after Grossman's death. Read Russia invites publishers worldwide of Russian literature in English translation to submit newly published works for the 2015 READ RUSSIA PRIZE! The READ RUSSIA PRIZE is a cash award of up to $10,000, divided at the discretion of the prize jury between the original English-language publishing house and the translator(s) of the work. The winning publisher also receives the opportunity to have a complementary audiovisual book trailer produced for the winning work or for a new work of Russian literature in translation that it is publishing. Who are the new Russian Tolstoys and Dostoevskys? Hosted by author and actor Stephen Fry and featuring the work of Dmitry Bykov, Mariam Petrosyan, Zakhar Prilepin, Anna Starobinets, Vladimir Sorokin, and Ludmila Ulitskaya. A film about Vasily Grossman, author of “Life and Fate” and other novels and reportage – this documentary is dedicated to the 50th anniversary of Grossman’s death. A film about author Victor Pelevin – who rarely appears in public, but whose writing, work, and life have influenced readers throughout Russia and worldwide. Some 20 documentaries about literature, arts, history, and culture will premiere at the festival. For more information, see: http://rusdocfilmfest.org/2014-about-en. A Digital Companion to Russian Literature - Read Russia Online is a curated hypermedia resource for the discovery and study of Russian literature. By presenting works of prose and poetry within networks of images, videos, audio files, historical documents, and scholarly commentary, our website offers the English-speaking audience a dynamic interactive space for exploring Russia's rich literary culture. Read more about Read Russia Online.